Recurring accounts of doom and gloom notwithstanding, Japanese film remains, year after year, not only one of the most productive of national cinemas but also one of the most diverse. Take the case of director John Williams: a long-time resident of Japan, this Welshman runs his own Tokyo-based production company, 100 Meter Films, which not only produces Williams’s own projects but also those of other filmmakers, Japanese and foreign, as well as making occasional forays into video art. Williams’s three features to date have all been vastly different in tone and scale. His debut Firefly Dreams (Ichiban Utsukushii Natsu, 2001) was a charming, naturalistic coming-of-age indie drama set to the languid pace of life in its countryside locations, while the director’s sophomore effort Starfish Hotel was a surrealistic and moodily stylish Haruki Murakami-esque fantasy starring such marquee-value actors as Koichi Sato and Akira Emoto. 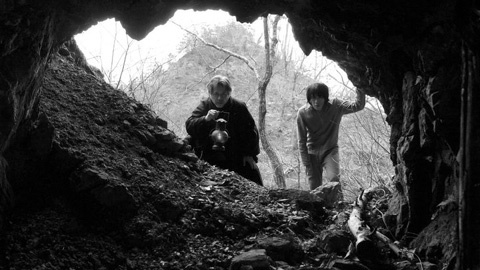 For his third film Sado Tempest, Williams takes a turn into what could be considered Toshiaki Toyoda territory, with a mystical tale of primordial powers both natural and supernatural that connects Shakespeare and rock ‘n’ roll, apocalyptic sci-fi and the most ancient forms of nature worship. 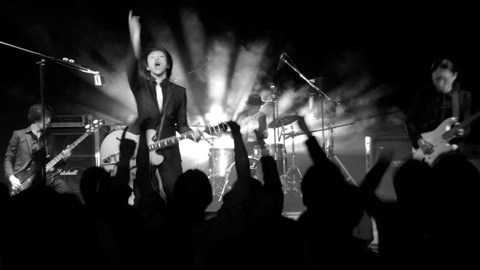 Featuring, though not quite a vehicle for, real-life rock band Jitterbug (or ‘Jiruba’ in its katakana rendering), Sado Tempest is set in a future when rock music is outlawed and concerts are, like any other illegal activity, under the sway of the yakuza. After being poisoned backstage after a particularly successful show, four musicians wake to find themselves exiled through the influence of an underworld boss (Tanaka) to weather-beaten and permanently wintry Sado Island, an ancient place of banishment for non-desirables, from emperors to dissident Buddhist priests. Declared dead back in civilization, the quartet have no choice but to subject themselves to the authority and whimsy of the local warden (Ichi), whose enigmatic mistress Miranda (Eguchi), the only woman on the island, takes an immediate if initially unfathomable shine to the rock group’s lead singer Jun 'Juntoku' Tokushima (Henmi, as a character whose name references a 13th-century emperor banished to Sado). Miranda’s ceaseless repetition of the first line of an old local ditty about demons is soon echoed by the singer’s visions of a wild-haired, masked ogre. When the mainland gangsters hatch the scheme of having the group record new material that can be passed off as the dead singer’s last material and thus make the criminals a fortune, Juntoku starts to take a special interest in Miranda’s mumbled lyrics. Spurring her on to reveal the rest of the song’s words, much to her jealous lover’s dismay, the rocker gradually unveils the woman’s dark past and the mysterious meaning behind the song – whose incantatory power could change the destinies of all involved. 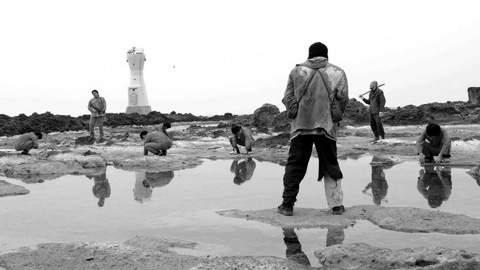 Beautiful visuals already characterised Williams’s previous films, but with Sado Tempest he outdoes himself: the remote island setting evokes the end as well as the edge of the world, as dark clouds permanently loom overhead and the snow falls down in flurries. What remains of civilization lies in ruin, from the concrete structures on the rocky coast to the ancient temples at the island’s sylvan heart. Flashbacks to memories of a luscious green forest growing in juicy soil only serve to contrast and highlight the barrenness of the prison surroundings, whose dreariness will only be overcome once the guitars and Marshall stacks are wheeled in and Juntoku and his mates set the concrete halls shaking with amplified rock. A fascinating example of hybrid filmmaking, Sado Tempest is at once the product of wildly diverse roots and a homogenously original creation. Williams is working in the shadow of Akira Kurosawa, who combined Shakespeare and Noh theatre many decades ago in Throne of Blood (Kumonosu-jo, 1957), but also in the slipstream of Toshiaki Toyoda’s recent films (there is an unmistakable kinship with Blood of Rebirth and Monster’s Club). 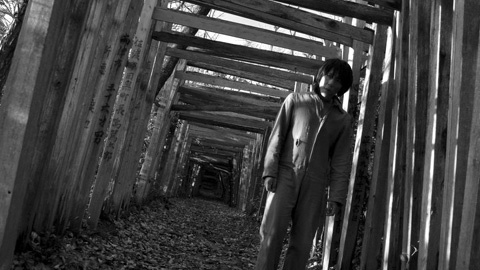 The cannibal-infested forests whisper distant echoes of Tsui Hark’s We’re Going To Eat You, while the lovingly shot ruins remind one of Kiyoshi Kurosawa's penchant for recording the beauty of desolation, particularly the not dissimilar Charisma. 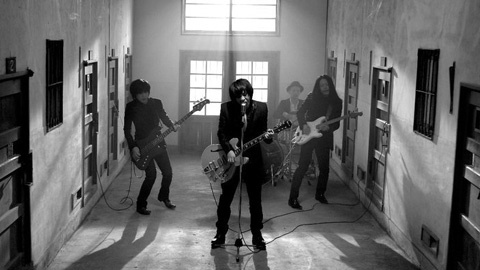 Then there are the scenes of Jitterbug’s on-stage rock antics, all dark suits and white neckties and therefore thoroughly in the vein of 1990s rockers Thee Michelle Gun Elephant – who provided much of the soundtrack to Toyoda’s very rockin’ Blue Spring (Aoi Haru, 2001) and whose domestic fame was so great that a farewell concert film entitled THEE was released theatrically in Japan by Nikkatsu, six years after the group’s demise. None of the above information is meant to detract from Sado Tempest, but merely to point out its hybridity. Yes, this is a Japanese film, not in the least for this very ability to assimilate such a wide range of influences into a thoroughly cohesive and distinctive new product. However, this would all remain matter for academic debate, were it not for the bottom line: that Sado Tempest is also, and above all, a most intriguing and entertaining movie.